Thanks for all your help. We had a great time going to Stonehenge for the Solstice. Thank you for a wonderful guided tour of the inner circle. What a fabulous sunset- just what I ordered. The Stonehenge tour was great! Want to be one of the few people to walk amongst the inner stone circle at Stonehenge? Our special access tours to Stonehenge in summer 2019 usually take place in the afternoon or evening. You will be picked up from Salisbury City centre and we will make our way to the circle via Durrington Walls. If you are staying in London and want to take advantage of these rare tours to the inner circle of Stonehenge the journey can be made by train giving you time to spend in the beautiful city of Salisbury. Leave Salisbury in the late afternoon. Visit Woodhenge and Durrington Walls where the builders of Stonehenge are believed to have lived. Hear about the exciting archaeological discoveries made by the Stonehenge Riverside Project during the last few years. 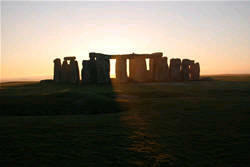 Visit all the sites seem in the PBS program Secrets of Stonehenge. Please note this tour involves some brisk walking across open grassland. Morning tours - we reverse the itinerary starting inside Stonehenge.Please note that no train will get you to Salisbury in time for the morning tour. 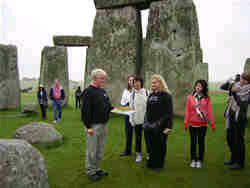 If you require other Stonehenge tour dates please contact us. We may be able to help you find a tour with someone else, but please note that these tours are very popular and book out fast. For information on the solstice see our Summer Soltice page.Please note there is no inner circle access at all in October or November. Accommodation in Salisbury can also be arranged at very preferential rates, but must be booked well in advance. Please see our Accommodation page. Salisbury is one of the most beautiful and interesting cities in England so it is well worth extending your stay here.